challenging to draw attention from the public for election support. As the matter of fact, CNRP has been cornered by Prime Minister Hun Sen in many aspects: after CNRP MPs entered the Parliament building, the “culture of dialogue” was promoted between Hun Sen and Sam Rainsy by leaving Khem Sokha in limbo; but while this approach is not meaningful for Hun Sen, the violence habit did occur instantly such as pro-CPP violent demonstrators to oust Khem Sokha from first vice president of the Assembly, and the severe physical attack on two CNRP MP members namely Nhay Chamroeun and Kong Sophea; the use of court to convict and jail both top leaders: Sam Rainsy and Khem Sokha, and the continual measures to tightening the politics of threat towards all CNRP’s members. 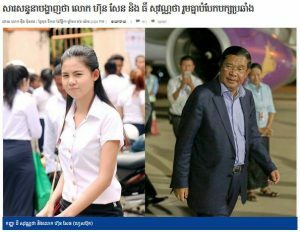 While the political misbehaviour of Prime Minister and his Cabinet has been unable to be checked by the State’s institution, the mischievous actions don’t translate righteousness to Prime Minister at all in order to maintain his long term political career on behalf of CPP party chief as well as in front of millions of Cambodian voters who have been concerting towards “change” for this country through the power of “ballot”. 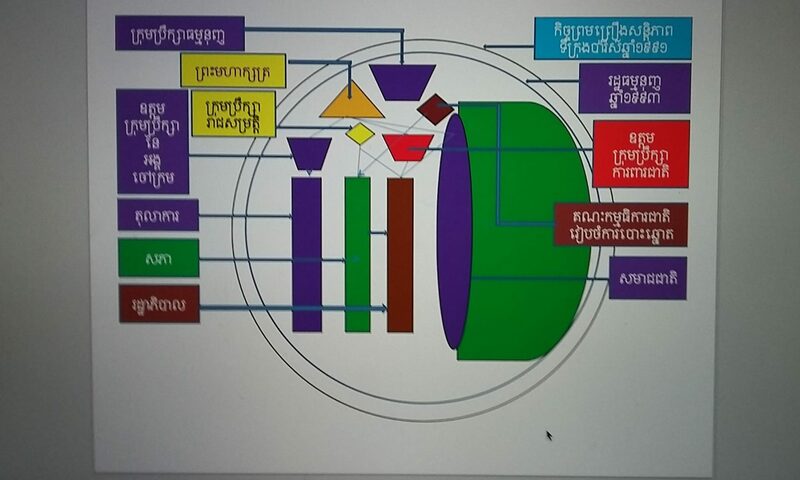 While the technical issue of map has longed of its disarray on the border demarcation between Cambodia and Vietnam, as now it is appearing for a public stunt, the disclosure of private conversation between Hun Sen and Thy Sovantha aka petite advisor Prime Minister called during whatsapp chatting, has significantly overhauled the violence’s status quo and it has likely been attempted to be forgotten. The chatting was uncertain at the beginning but after more leaks have come to the public especially the chatting between Thy Sovantha with Hun Manith, son of Hun Sen who is holding special position in the government as FBI-like department, to organize force to topple and humiliate opposition’s leaders unlawfully, the online childish-like chit-chatting is assumed genuine. Through those lengthy chit-chatting, one could summarize the topics are from personal health check, to family members linkage, to plans of toppling and intimidating opponents, and to disbursing one million of dollars to cover up Thy Sovantha’s assigned tasks etc. What is intriguing for the public and Cambodian observers is the chit-chatting between grandpa and grandchild sounds non-serious, nonsensical, and miscellaneously. But the outcomes from such miscellaneous has surely shivered the opponents on prospective violence that have been running unchecked by the State. As the secrete has embodied to the public, the action plans from this unlawful activity might be undeterred, and the youngs are visibly exploited by the olds at the highest. After listening to RFA in Khmer services for their “call-in-show-forum” program (as recorded in youtube here), listeners might be serious, entertained, or sitting idle as usual. The five guests have expressed their diverse opinions among one is representing government (sic), and other four are representing non-governmental citizens; unfortunately, we didn’t have one official representation of the government to the show. With explicit ardent interrogative questions from the host, Mr. Chun Chanbot, Sam Rainsy who is president of the CNRP has exhibited his pragmatism into the issue more than other elses. His approach to always anticipating “dialogue” to keep the flame alive over all sensitive issues within Cambodian contexts. His firm stance on protecting Cambodia interests doesn’t mean he must reject other alternative scenarios. The border’s scheme between Cambodia and Vietnam, like it or not, it has become a play full of fever audience, screaming, exploitation, and deadly consequences. For static conservationists, the great past of Cambodia must be revitalized while their actions and plans are not tabled to discuss on how and when we are going to achieve it. For whistle-blowers, the noisy street talkers are usual in their daily business, while the doers are always facing searing deadlock. As a leader of more than half of total country-population voters, Sam Rainsy has scrupulously stepped ahead many steps to ensure the boat is vital leading to “ballot” power in 2017 and 2018. In short, the triggering scenario from Prime Minister must be attentively conveyed although we don’t know how much PM has seriously studied on such proposal, but it is a politics which means so much on its consistent changing moment to always anchor the momentum. The agreement between Cambodia and Vietnam to propose legal map from France government to judge on all odds of border demarcation irregularities between the two states is heard from government’s rhetoric, but till today we have not seen any public note or transparency from such agreement. 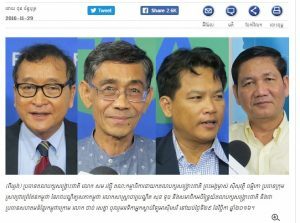 If government’s border-related department don’t disclose the agreement to officially request map from France, and if none of the other Cambodian parties have joint this task-force, the business of border politics is not different from those static conservationists and street talkers. Cambodia needs a “complete one-package framework” to solve border scheme as well as to alter borderline politicization that has always hindered sustainable growth of Cambodia.